We work with our clients to deliver custom solutions that meet the requirements of their most demanding applications. See how we are collaborating our clients to deliver innovative solutions that ensure the electrical and mechanical reliability of your assets. Our commitment is to strive for excellence in all markets where we do business. See how we are helping our clients make the right connections. Meeting the highest performance standards to offer a comprehensive range of heat shrink and cold shrink products for a variety of cables. Medium voltage heat shrink and cold shrink splices from Shawcor Connection Systems group are available for applications rated 5 kV to 35 kV, and designed for single-conductor and three-conductor non-shielded, metallic tape, wire-shielded, concentric neutral, jacketed concentric neutral and LC-type shielded cables. Joints are suitable for the renewable energy, electric utility, industrial and oil and gas markets. Our kits are factory-designed and independently tested to IEEE 404 standards. CJ series joints are single-core, 15 kV to 35 kV, heat shrink joints for XLPE and EPR extruded dielectric, bare and jacketed concentric neutral cables. The CJ 10J series joints use the same joint components as the CJ 10 series joints, but are supplied with a wraparound jacketing sleeve to seal from cable jacket to cable jacket on jacketed concentric neutral cables. CJ 20 series joints are single-core, 5 kV to 35 kV, heat shrink joints for XLPE and EPR extruded dielectric, metal tape, wire and lead sheath-shielded power cables. The CJ 20 series joints are supplied with all of the hardware required to shield and externally ground the joint without soldering. 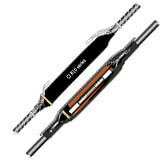 Most of the joints can be supplied with either a tube or a wraparound sleeve for the outer jacket. CJ LC series joints are single-core, 15 kV to 35 kV, heat shrink joints for XLPE and EPR extruded dielectric, longitudinally corrugated type LC cables. 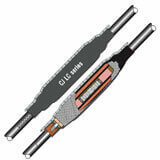 The joints are supplied with all the hardware required to shield and externally ground the joint without soldering. Dual moisture blocked tinned copper braids with constant force springs make the connection of the LC shield across the joint and to ground. 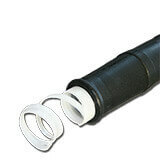 The wraparound jacketing sleeve allows for reduced installation space. These cold shrink cable joints are available for 1/C, 15 kV XLPE and EPR extruded dielectric, bare and jacketed concentric neutral power cables for the electrical utility market.